Dr. McCullough specializes in obstetrics and gynecology with an interest and extensive experience in gynecologic daVinci minimally invasive robotic surgeries. He received his medical degree from the Ohio State University, School of Medicine and completed his residency at Wright State University, School of Medicine. He acquired an MBA-healthcare concentration degree in 2010. Dr. McCullough serves as a medical staff director and Credentials Committee Chair. He is past chairman of Kettering Medical Center OB/GYN department and past chairman of Dayton OB/GYN Society. Dr. McCullough is Board Certified and is a fellow of the American College of Obstetrics and Gynecology. He also belongs to the Montgomery County Medical Association, Ohio State Medical Association, the American Medical Association, and The SIE National Management Honorary and Professional Society. 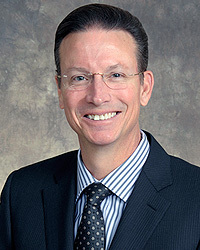 Dr. McCullough is chief of staff for Kettering Health Network in 2014, putting his MBA with healthcare concentration to work in a hospital setting.